Besides announced the Motorola GLEAM, Motorola Mobility has also announced its Android based smartphone which is known as Motorola PRO. 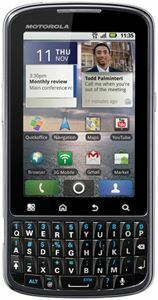 The Motorola PRO is being designed for business use with speed, convenience, security and productivity tools. The power of the Android smartphone is booted up by 1GHz processor and runs on Android 2.2 Froyo operating systems. Featured with 3.1-inch multi-touch brilliant display which operates in 480 x 320 resolutions, the Motorola PRO is also equipped with a 5-megapixel camera with auto-focus and dual LED flash. It boasts with 2GB of internal memory, has built-in encryption and security features, integrated with A-GPS, supports 3G, WI-Fi and 3G hotspot capabilities (up to 5 devices), preloaded with QuickOffice and supports email. In addition, it is Bluetooth enabled and supports up to 32GB of microSD memory card. The MOTOROLA PRO is now showcase at Motorola booth at Mobile World Congress (February 14-17th) and is set to come to Europe. However, the price of the phone is not yet announced.